Your future is your future. Your past is your past. Your future is not your past. You may suddenly be thinking why on earth am I discussing English grammar on a blog about life, simplicity and the universe! Well, the reality is that I regularly meet people who base what is going to happen in their lives on what has happened in their history and of course, this is completely understandable – that what has happened will keep happening because it has always happened. Our life experience is based on what we have done, said, thought, been told and so on. And yet, what if we didn’t do this? What if we separated the two? 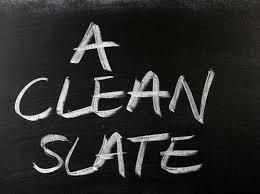 What could happen if we gave ourselves a metaphorical ‘clean slate’ to move forward with our lives in the direction we really want? We would then be responsible for our own futures. Maybe some would prefer the familiarity of the status quo because they are happy with the familiar, even though they may not be happy with the situation itself. But what about those who would embrace being responsible for their own futures? Regardless of what has happened before, however difficult. There are many examples of people who in their own way have done this throughout history including Nick Vujicic, Nelson Mandela, Harvey Milk and Liz Murray. We all have a choice. Your past is your past. You no longer have control over what has happened. It’s been and gone. Your future is your future. It begins the moment you decide.